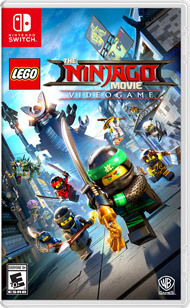 GameStop has the Nintendo Switch LEGO Ninjago Movie video game on sale for just $19.99 (regularly $29.99). Find your inner ninja with the all-new LEGO Ninjago Movie Video Game! Play as your favorite ninjas to defend their home island of Ninjago from the evil Lord Garmadon and his Shark Army. Master the art of Ninjagility by wall-running, high-jumping and battling the foes of Ninjago to rank up and upgrade the ninja's combat skills.